Can you believe it is June? Half the year is gone. I didn't make any goals or resolutions this year, I felt a turmoil in my spirit and I was right. So I just take each day as it comes and hope for the best. Life is a strange, wonderful, adventure that takes us places we may never have thought of. Not so much physical places but those deep recesses of our mind and spirit. A place of growth and knowledge. A place where age gives you some sort of immeasurable confidence to accomplish. I have said many times, "There is nothing good about getting old" I was wrong. I was looking at it from veiled eyes. I "see" things differently now and I look forward to the future, wherever that may take me. 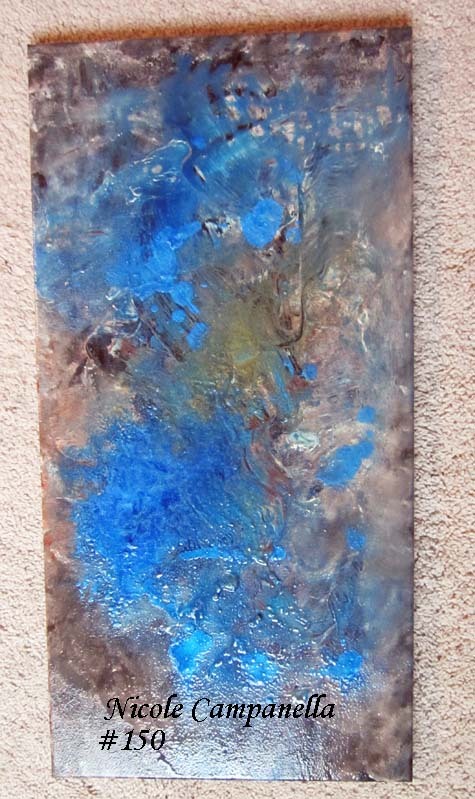 12x24" Acrylic abstract #150 for my Art Everyday. I used a very shinny liquid acrylic blue to top this. Can't really see how metallic it really is. 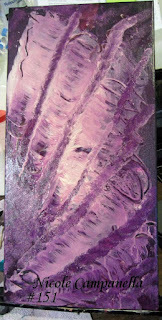 Linking up with the wonderful ladies Eva and Kristen for Paint Party Friday. 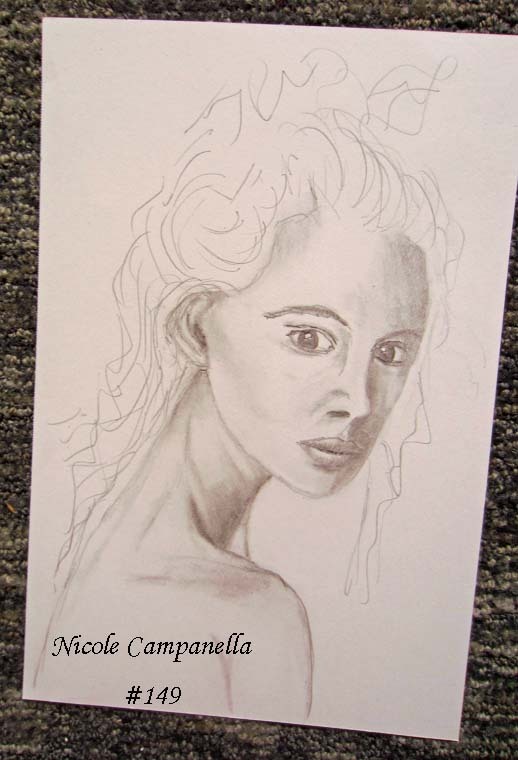 Come see what artists have joined in to share their art. 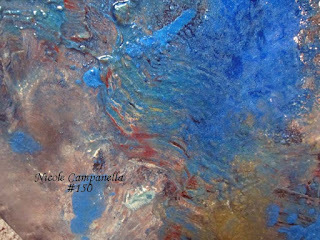 Nicole, your abstract pieces are stunning...so gorgeous!!! 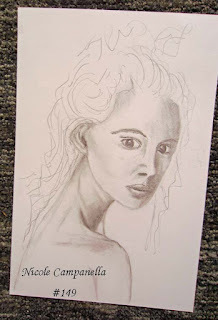 Fabulous sketches and abstracts! I especially love that pop of blue with metallics. Lovely! What a thoughtful post, Nicole. I know what you mean, what with Brexit and Trump, the world is a very crazy place just now where everything feels very uncertain but I've decided rather than get overwhelmed by things I have no control over, I will simply live inside my own little bubble and listen to as little of the world's outside events as I possibly can. It's not that I no longer care but I think it's important that we surround ourselves with positive energy rather than helping all the negative energy to grow by giving it head space, if that makes sense. I agree there are certain aspects of growing older that I enjoy - caring little what anyone else thinks anymore is one of them, although I'm not so keen on the other physical changes coming my way! I especially love this first piece - I can see a hint of how wonderfully metallic that blue paint it and it reminds me of the inside of a shell, like mother of pearl of abalone! Happy PPF. Oh my, I'm LOVING that blue color you added, sometimes blue is so stunning. It must be reminding me of the ocean. I feel just as you about aging, I'm glad the years keep coming, bring them on, I'm looking forward to them. Visiting from PPF. Your acrylic paintings are terrific - so textural, and the portraits are really wonderful. You nail the expressions and emotions in them. Cheers now and Happy PPF! Fantastic abstracts and your face drawings are so beautiful always ! Happy PPF! and happy weekend Nicole! I love the colours of abstracts and my fav portrait is the first one, most beautiful face with great expression. 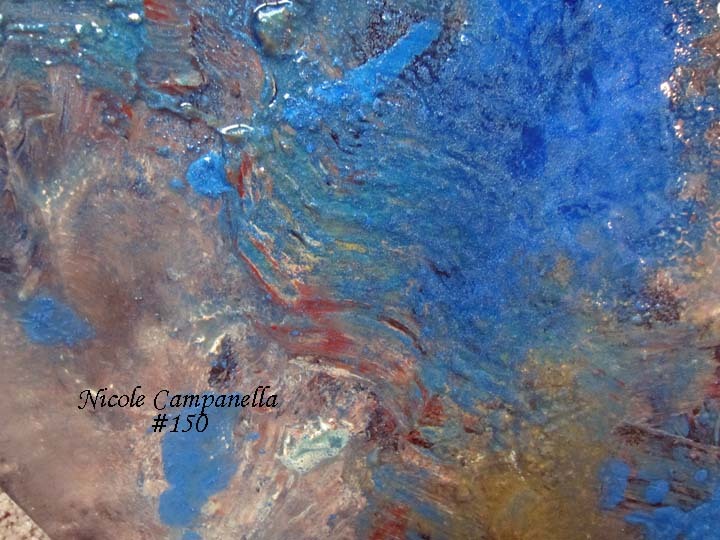 beautiful art as usual!Love the metallic abstract. Happy PPF! I especially love some of those portraits - really beautiful work. Happy PPF! 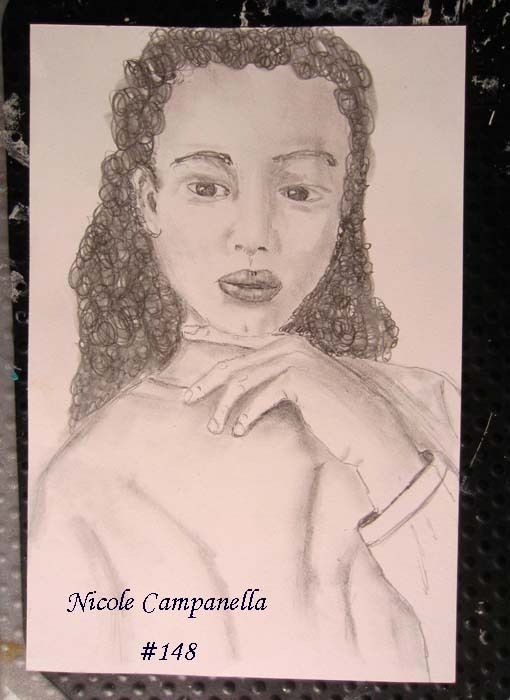 Your talents are so diverse, Nicole. I love the abstracts and I can see part of the shiny blue so I know it must be an amazing piece. As always I think your portraits are top notch. Thanks for the bean burger recipe. I tried it out and the results were great. I will probably make it many times over time. The only drawback was all the bowls and things I had to use. Probably with practice I could cut down on them. Very delicious. Your work is stunning as always Nicole! Hello Nicole, Yes, this life is an amazing adventure. We can dive as deep as we wish into the cauldron that awaits us. Yes being older has some wonderful advantages, but right now it is hardest that I can truly remember when America was a democracy and lead the world toward peace and good will. When I was younger, I never dreamed someone (actually many someones) could take that away from us, but they have ... for the moment. Hopefully the strength and compassion that I know is what America is about will win out and the world will be right again and hope will have true meaning. Your art is always a wonderful respite from days like this ... thank you for being you. YAY!! Look at you go, girl! I love what you are creating - and that you are doing it daily!! SO AWESOME!! Lovely blue colors in your painting! And beautiful portraits! gorgeous abstract!!! And more lovely faces!! Sage words I totally agree with!! Aging is different, with unique advantages youth is robbed of!! Gorgeous artwork and love how you capture worry, pensive thought and anger uniquely on each face! Wonderful work as always!! 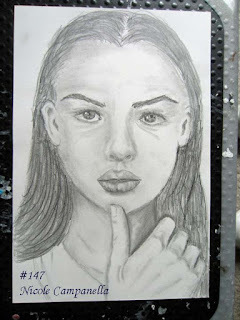 Wonderful abstracts and delightful portraits ~ you are so talented ~ You go girl! Love your portraits and the abstracts! You have been very busy! The sketches continue to amaze and the abstracts are lovely. You are absolutely on the mark about age giving the confidence to accomplish. Wow! You inspire me to create more. I love have you've created a variety of things. Your sketches and abstract are fantastic. That blue is gorgeous. While I never set any goals for the year, one goal I have for the summer is to spend more time creating things in my art space. Happy PPF! 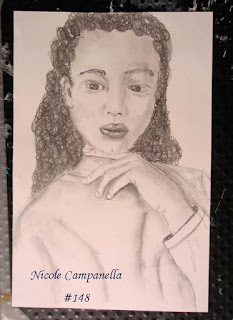 Nicole, I understand about your spiritual journey! I am with you my friend! Your abstract paintings are so beautiful! I really love them!!! And, your faces are AMAZING! WOW! Big Hugs and Keep being you! I really love your abstracts - that is a gorgeous shade of blue. Love the colors and portraits are gorgeous! Love the abstracts which seem to reflect your new age philosophy, and lovely portraits.